Millionaire investors did not get that way without taking risk. Six-in-ten Millionaires consider taking risk to be the primary factor in their wealth creation, following hard work, education, smart investing and frugality, according to a wealth level study conducted by Spectrem Group of households with a net worth between $1 million and $4.9 million. Most, though, (60 percent) profess a moderate risk level tolerance and a willingness to place only a limited portion of their investments at risk. Forty-four percent prefer a guaranteed rate of return for the majority of investments, while only four-in-ten would be willing to take significant investment risk on a portion of their investments to earn a higher return. Not surprisingly, the highest percentage of Millionaires willing to take that significant risk are Millennials ages 35 and under as well as those ages 36-44. Conversely, seniors ages 65 and up, more focused on protecting their principal in their retirement years, are the least likely to put a significant portion of their investments at risk (34 percent). 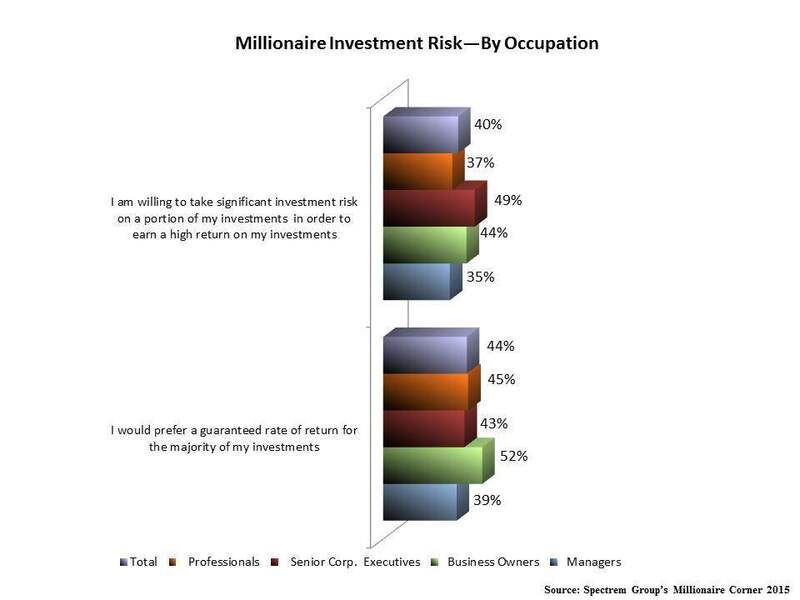 Millionaire business owners rank taking risk third behind hard work and smart investing as the primary factor in their financial success (79 percent vs. 59 percent of Millionaires overall). Still, they comprise the highest percentage of Millionaires who indicate a preference for a guaranteed rate of return for the majority of their investments (52 percent). They rank second behind senior corporate executives as those who would be willing to take significant investment risk on a portion of their investments to earn a higher rate of return (44 percent vs. 49 percent).